A Ferree family gathering was held at the Giles Chapel, UMC, in Asheboro to celebrate the unveiling of a monument to Solomon and Rebecca Ferree. The program began with a "meet your family" fellowship time. A covered dish luncheon was served following the invocation given by Reggie Ferree. After lunch, a play written by Donna Jernigan was presented which depicted William Penn and Madame Ferree meeting with Queen Anne to seek approval for the land grant in America and then Madame's arrival in the Pequea Valley and greeting by Chief Tanawa. 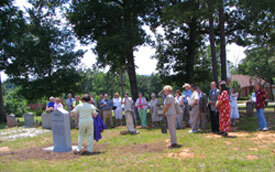 Following the play an unveiling of the monument was led by Sylvia Cox. "The Music of God's Family" was provided by Daniel Jernigan and concluding the program was Dr. Charles Heisterkamp, Ferree genealogist, who spoke about Ferree history. Solomon Ferree, the first Ferree to settle in North Carolina, was the son of John Ferree and Mary Elizabeth Musgrave and the grandson of Madame Ferree. Sylvia Cox and her daughter, Donna Jernigan, organizers of the event, are 10th and 11th generation great granddaughters of Madame and Daniel Ferree.